Durable and easy to work with, the Winco BSOT-13 Solid Stainless Steel Basting Spoon, 13" is perfect for busy commerical kitchens. 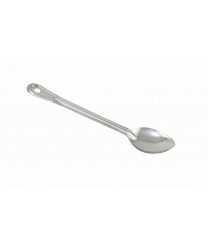 Featuring a long, slim handle, this non-perforated basting spoon keeps your hands at a safe distance from the heat. The handle has a hang hole at the end, so you can store the spoon within easy reach near the oven or stove. Use the spoon to prepare a variety of dishes, from roast or turkey to cooked vegetables.